Valletta is not just a centre of economic and social activity but also a cultural hub for families and friends particularly during the festive season and on New Year’s Eve. An attractive line-up of artists will be performing at Pjazza Teatru Rjal and Pjazza San Ġorġ where the New Year will be ushered in with a 3D Architectural Projection countdown and fireworks. 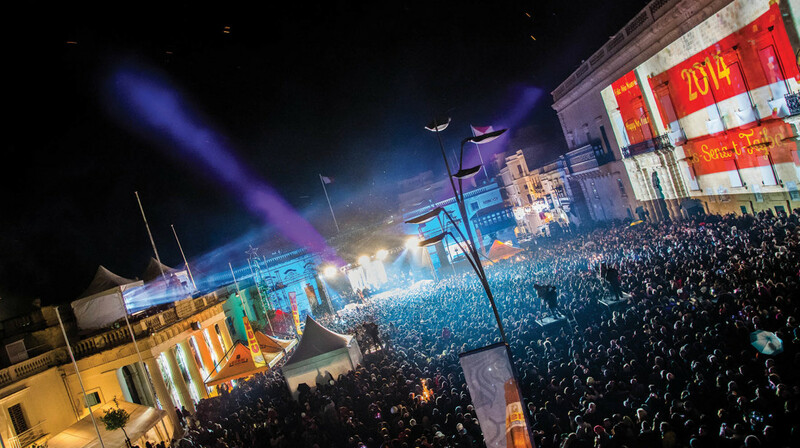 The Valletta 2018 Foundation together with the Valletta Local Council and G7 Events announced the final details for national New Year’s Eve celebrations in Valletta. Addressing a press conference on the main stage at Pjazza San Ġorġ this morning, Valletta 2018 Foundation Chairman Jason Micallef said: “The entertainment and experience Valletta offers is an attraction for thousands who participate in the annual national NYE festivites annually. This reflects the Foundation’s committment and synergy taking place in preperation for 2018”. The Minister for Justice, Culture and Local Government Owen Bonnici said, Valletta is not just a centre of economic and social activity but also a cultural hub for families and friends particularly during the festive season and on New Year’s Eve. He pointed out that restaurants in Valletta are fully booked and this augurs well for all involved. During tomorrow’s festivities, Valletta will be joining several other cities in the world to welcome the New Year. Activities are planned for all ages and people of different tastes. Celebrations are a result of stronger collaboration between entities including the Valletta Local Council, the Malta Tourism Authority, the Tourism Ministry and the Ministry for Justice, Culture and Local Government as well as the private sector, with the coordination of Valletta 2018. Such collaboration from the Valletta 2018 Foundation started last year and is intended to grow further by 2018. Tourism Minister Edward Zammit Lewis said these events are important from a tourism perspective as tourists who are in Malta for their holidays can be part of celebrations. He reiterated his commitment to have an attractive calendar of events in place all year round and which involves the capital Valletta. This continues to attract visitors while increasing activity in the capital. Valletta mayor Alexiei Dingli encouraged people who will be in Valletta tomorrow to use public transport and alternative means. Buses will be operating on a special service at €3 and will go on until the early hours of the morning. The Upper Barrakka lift will be in operation till 4am. The Director of G7 Events Owen Spiteri highlighted that all is set for tomorrow when an attractive line-up of artists will be performing at Pjazza Teatru Rjal and Pjazza San Ġorġ. The national celebrations bringing people together in a festive atmosphere in the streets and public areas of Valletta is not to be missed.